In the face of genocidal Muslim fanaticism, leaders of the nations that have the Bible in common seek common political ground. On November 9, five US Congressmen ventured into otherwise uncharted territory, at least by the standards of traditional diplomatic delegations to Israel. A strong affinity to Israel and genuine frustration with repeated fatal failures of "peace processes" drove these American leaders to take a fresh look at Israel's heartland. The tour is a manifestation of the "Judeo Christian" teamwork that has been growing deeper in recent years, as pioneering Jews in Judea and Samaria and Christian Zionist leaders in the US and elsewhere learn to trust each other. In the face of genocidal Muslim fanaticism, leaders of the nations that have the Bible in common are seeking common political ground as well. The historic visit began with a bus tour led by Mayor Ron Nachman along the Trans-Samaria highway, where the delegates learned about Israel's narrow waistline, security needs and strategic provisions. At the Ariel and Barkan Industrial Parks Mayor Nachman discussed co-existence, the 4,000 Arabs employed at the factories and the indiscriminate boycotts imposed by the Palestinian Authority (PA) and European Union on products from the factories. Mayor Nachman also showed the group the layout of the Ariel Bloc of communities, and the short distance from the Tel Aviv Coastal Plain. The Congressmen learned about Judeo-Christian teamwork and at Israel's primary outdoor training facility, the Ariel National Leadership Development Center. From there the group proceeded to the Ariel Regional Center for the Performing Arts, where they enjoyed a private performance by Ariel's young singers and internationally renowned dancers. Before travelling north, the visit to Ariel culminated with the inaugural Samaria Summit luncheon, where municipal leaders, industrialists, business-people and professional athletes from across Samaria and the Jordan Valley gathered to discuss issues of relevance. Lior Shachory, CEO of the Ariel based Incentive Technology Incubator presented some of the R&D at the award winning center, whereas Eldad Halachmi, VP at Ariel University Center, made reference to U.S. State Department boycotts of R&D funding for academic research due to Ariel's location beyond the green line. The Samaria Summit was the first time that a Congressional delegation engaged face to face with the geo-political realities in one of the most media-covered regions in the world. Rep. Randy Forbes (R -VA-4th) addressed the Summit by stating his unwavering support for Israel's peace and security. Rep. Doug Lamborn (R-CO-5th) discussed Israel's inherent value and the commitment of the Congressional Republican Israel Caucus and the Israel Allies Caucus which he co-chairs. 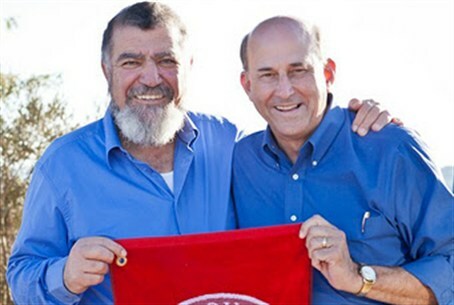 Rep. Louie Gohmert (R-TX-1st), who is known for his instrumental role in arranging for Prime Minister to deliver his acclaimed speech to both houses of Congress in May, 2011, explained how Israel cannot sacrifice its own security by relinquishing land to those who are committed to its destruction. They were joined by Congressman John Fleming (R-LA-4th) and Congressman Jim Jordan (R-OH-4th), who shared the sentiments of their colleagues. The travels through Samaria included a stop at Joseph's Tomb Lookout Point, where David Ha'Ivri of the Samaria Regional Council Liaison Office explained the discrepancies between popular rhetoric concerning the status of Arabs living in Shechem and the PA's insistence on preventing refugees under their jurisdiction from improving their quality of life. Ha'Ivri introduced the delegates to Rav Eliezer Melamed, Rabbi of Har Beracha. The congressmen were pleasantly surprised to discover that Rav Melamed recently published an article which encourages Israelis to be welcoming rather than suspicious of Christians who choose to support Israel. The group then proceeded to the vineyards in the community of Har Beracha, where they met with the Director of the Samaria Regional Authority, Gershon Mesika. Tommy Waller and the Christian volunteers from across the US who accompany him in the fields of Samaria greeted the group with some of their original music. Following a visit to the site of the Tabernacle in Shilo, the delegation had dinner at the Psagot Winery. Yesha Council Director Naftali Bennet challenged the Congressmen to change the anti-Israel rhetoric prevalent in the media by describing the realities that they encountered, and to help their colleagues and constituents understand that the Iranian nuclear program is not merely a threat to Israel but a threat to the free world. The 2011 Congressional Initiative was arranged by Heather Johnston, who identified the need for America's leading Congressmen to become familiar with Judea and Samaria and develop ties with Members of Knesset.